What Information Is Required On Cosmetic Labels? Do you have a cosmetic product that is ready to be labeled and pushed out to customers? Whether it’s a soap or skin care product, there are incredibly strict requirements on what is necessary to display to your customers, and it’s important to make sure you have the correct information included before your labels are finalized. Make sure to check out the guidelines, and if you still have questions feel free to contact us! We’d be happy to help you with all of your cosmetic labeling needs. Here at SheetLabels.com, we make it our mission to provide our valued customers with excellent customer service, high-quality products, quick turnaround time, and helpful labeling advice and education. To make the process of creating cosmetic customized labels as easy as possible, we’ve put together a list of the top seven most common cosmetic labeling mistakes that cosmetic companies make—and how to avoid making these mistakes on your own products. Read on to learn more and be sure to follow our News & Sticky Notes Blog for the latest labeling industry news and updates. If the front of your product’s packaging includes a snippet of your product ingredient list but not the whole ingredient list—the product could be considered misbranded. For example, if your soap products feature tea tee oil, aloe vera, and coconut oil in the ingredient list, but the product’s front-facing label refers only to tea tree oil, you could have a problem. If you’re selling a product that doesn’t make any cosmetic claims (such as it being a skin moisturizer or acne reducer), then an ingredient list is not usually required. However, if you do make cosmetic claims, you need to follow the FDA’s cosmetic labeling guidelines. In this case, an ingredient list is required. Like all customized labels that must be regulated by the FDA, ingredients must be listed in order of predominance by weight. Additionally, all ingredients should be separated by commas and not by the word and. Cosmetic labels and ingredient lists are difficult enough to read, so it’s important that you use the correct type size and fonts required by the FDA. Once you’re familiar with the FDA’s type size guidelines, physically measure the printed lowercase o on your customized labels as well as the printed uppercase L.
Bolding the net weight of the product may not seem like a huge deal, but it is. The net weight of your cosmetic product must be located near the bottom third of the product’s principal display panel. Additionally, the net weight must be bolded. Mica refers to mica-based pigment and all mica-based pigments must be included on cosmetic labels. If a product uses aqua pearl mica (like in this example from Bramble Berry), the ingredient list would need to include all the mica-based pigments, including mica, titanium dioxide, iron oxide, and chromium oxide green. All company contact information should be included on cosmetic customized labels. However, many cosmetic companies tend to forget that this information is required. If a company is listed in a telephone directory or city directory (in print or online), the street address may be left out. However, the manufacturer or distributor name, city, state, and zip code must all be listed. To learn more about cosmetic labels and to create eye-catching beauty industry labels, contact SheetLabels.com today. These days, shoppers are all about making informed purchases. With more and more people going for natural, vegan, organic, biodegradable, and recyclable products, various symbols are popping up all over the labels of cosmetic and personal care products. These symbols continue to grow in popularity since they make it easier for many people to find the types of products they’re looking for. To get ahead of the game and keep up with your competitors who are having their product stickers printed with these symbols, it’s important for you to first understand what each of these seals means. Like organic foods, organic cosmetics must only contain organically produced ingredients without synthetic pesticides or fertilizers. USDA Certified Organic products may use the USDA Organic seal if they contain at least 95 percent organically produced ingredients. The other 5 percent of ingredients must be ingredients that are not available in organic form. Products that are made of 100 percent organic ingredients do not have a specific seal, but the USDA Organic seal may be used in addition to the phrase “100 percent organic”. There is no seal for products that are made with organic ingredients, but in order to use the phrase “made with organic ingredients” on the product label, the product must be made up of at least 70 percent organic ingredients. Organic and natural do not mean the same thing. However, products with the NATRUE seal mean that a product is made up of natural and organic ingredients, using minor manufacturing methods and environmentally-friendly practices. These products are also not tested on animals. Synthetic fragrances, colors, petroleum-derived or genetically-modified ingredients are not allowed in NATRUE products. On the other hand, natural products are unregulated, do not contain a seal, and do not have to contain completely natural ingredients. Natural is a term used to define products that contain a combination of plant-based or plant-derived ingredients, and any product can use the term. However, manufacturers must use their own personal discretion when labeling products as natural. Products that are naturally-derived do not contain a seal, but manufacturers can market the product as naturally-derived if the product was produced from ingredients found in nature. These products may also contain chemicals or be treated with synthetic ingredients. There are two types of reputable cruelty-free seals that can be used. 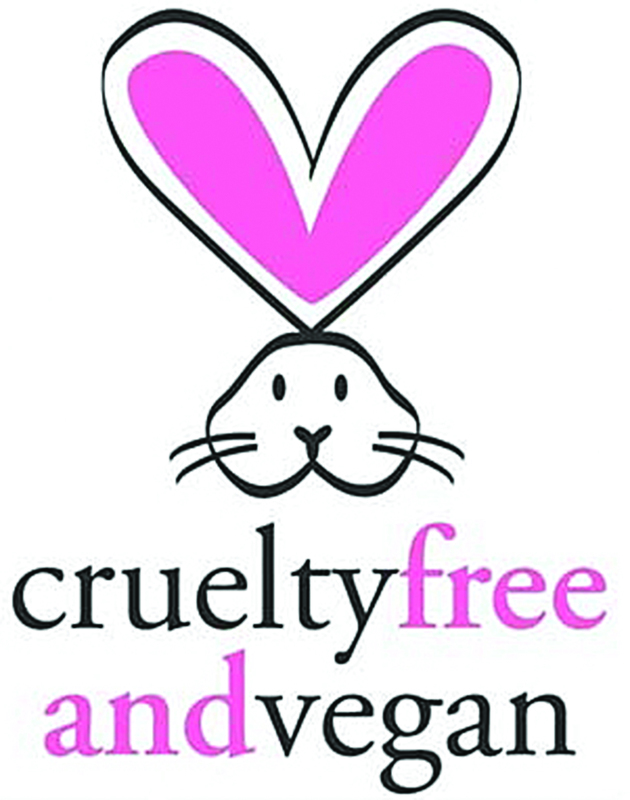 The first means that the product is cruelty-free and vegan, and the second means that the product is specifically cruelty-free and not tested on animals. Products with the Cruelty-Free and Vegan seal mustn’t contain any animal-derived ingredients including honey or beeswax, and none of the ingredients may be tested on animals. The Leaping Bunny seal means that animal testing was not performed during any part of the manufacturing process, and that none of the ingredients have been tested on animals. Product stickers printed with the Leaping Bunny logo mustn’t be tested on animals, but do not necessarily need to be vegan. SheetLabels.com has the experience, tools, and resources you need to shine in the cosmetics industry. Have your product label stickers printed through us and enjoy our large selection of cosmetic labels. We’re looking forward to serving you! The natural skin care and personal care movement is in full force and shoppers are becoming more and more knowledgeable about the products they choose to use on their bodies. More than half of American women want their skin care products to be all natural, according to Skin Inc. Cosmetic label printing makes it easier to reach your target customers when you do switch out your conventional ingredients to natural and organic materials. All you need to do is learn about the ways in which you can label your natural products! In an online poll published by PR Newswire, 1,000 American women were surveyed about their beauty product preferences. The Green Beauty Barometer poll found that nearly 60 percent of women read beauty product labels to avoid certain ingredients. According to the survey, 29 percent of women would like to avoid sulfates, where 22 percent would like to avoid parabens, and 18 percent prefer to avoid synthetic fragrances. PEG compounds and mineral oil were also included at 15 percent and 11 percent. According to Consumerist, 57 percent of shoppers prefer to purchase products that are cruelty-free and are not tested on animals. However, Only 43 percent would be willing to pay more for cruelty-free products. The same goes for eco-friendly products. 81 percent of shoppers believe that eco-friendly beauty products cost more than the average beauty product. 61 percent of the people surveyed would only buy an environmentally-friendly beauty product if it cost the same or less than a non-green product. If you do sell natural, organic, eco-friendly, cruelty-free, or fair trade certified products, you can easily label your products to attract customers to your brand. Product label printing makes it easy to grab the attention of conscious shoppers, especially in an industry where more than half of shoppers are reading product labels. 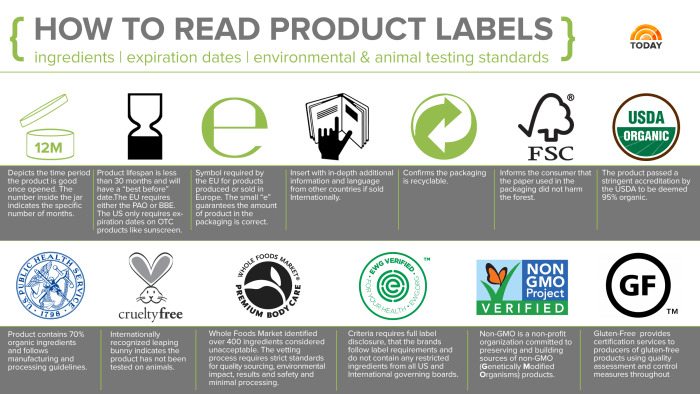 For natural, organic, cruelty-free, eco-friendly, or fair trade beauty products, there are specific logos available to include on your product label, but many of them require a certification or an application process before you have the go-ahead to become certified. While this is sometimes a time-consuming process that comes with a price, it is often well worth it to satisfy shoppers. To include the Leaping Bunny logo on your product labels, which signifies products that are cruelty-free and not tested on animals, you need to first follow the Leaping Bunny Certification Program. There are other cruelty-free logos to look into, but the Leaping Bunny logo is internationally known and trusted. To market your beauty product as Certified Organic, you will need to become certified by the United States Department of Agriculture. However, you don’t need to follow any rules or regulations from the USDA or FDA in order to market your product as natural. Natural products should be minimally processed and should not be misleading. If you label your product as natural but it actually contains artificial and processed ingredients, you could end up harming your brand. As the name states, you must first become certified in order to label your product as Fair Trade Certified. Eco-friendly products, on the other hand, are a bit trickier to label. Green means a variety of things but is typically defined as a product that has less of an environmental impact than a regular product would have. Green Seal can help you to make the best product label printing decision for your eco-friendly beauty product.